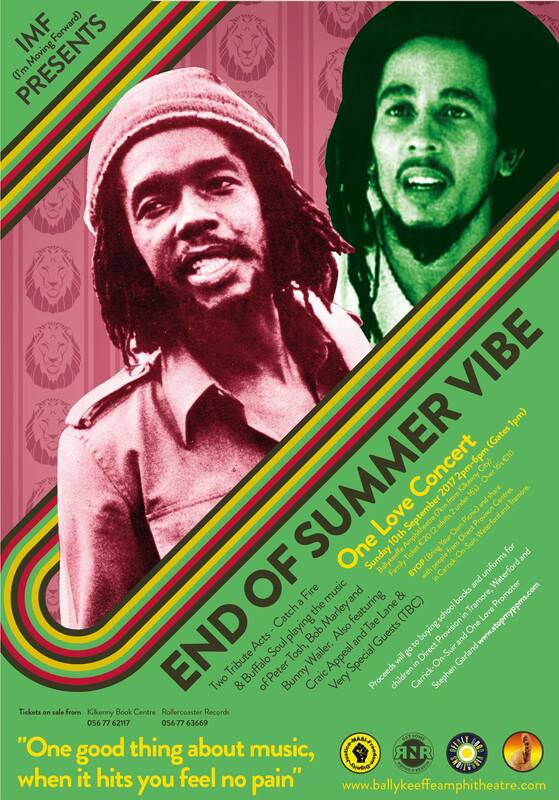 It is with a heavy heart and great trepidation that unfortunately we have to postpone our End Of Summer Vibe/One Love Concert scheduled for this Sunday 10th September in Ballykeeffe Amphitheatre Kilkenny. The reason that I decided to pull the plug was based on 2 factors. The first and most importantly was the weather. It’s 95% forecast of rain and also to be cold. This is not at all conducive to the vibe we want to generate. As we have so much good people giving their time and talents for little or no monetary gain we have taken the tough decision to postpone until early summer 2018. The residents in Direct Provision Centres in The South East at Waterford and Tramore are disappointed that the concert will not go ahead but are happy that something will be organised in 2018. This will give us more time to highlight the plight of people in Direct Provision and hopefully this time next year Direct Provision will be dealt with for the betterment of everyone. In the meantime please support the initiative of Kilkenny Solidarity Dinners Solidarity Kilkenny who have being doing fantastic work in organising some great afternoons with our brothers and sisters in Direct Provision. We have got so much support locally and nationally with this event. In order to do it justice we will look forward and move forward together for making OneLoveKK 2018 a reality. Thanks to the following for their support and goodwill. All the Crew at Ballykeeffe Amphitheatre, Martin Leahy for designing poster. Perfecto Print Kilkenny, Rollercoaster Records Kilkenny, The Book Centre Kilkenny, KCLR fm, The Kilkenny People, The Kilkenny Reporter, The Kilkenny Journal, Lucky Khambule MASI (Movement of Asylum Seekers Ireland), Broadsheet.ie, Residents in Direct Provision Centres in Waterford and Tramore. Oliva Lyng, Gareth Hanlon, Sandrine Dunlop, Geraldine Fahy, Emmanuel & Nic at Kilkennny Solidarity Dinners and for everyone else who i’ve missed who has got behind this event and will get behind it again in 2018. Our mission was to bring people together in one love and one positive vibration. Through the music of Peter Tosh Bob Marley and Bunny Wailer and original Irish artists inspired by The Wailers and the one love vibe. We still endeavour to do that but it will be next summer. I also want to acknowledge once again that I am aware of the homeless crisis and mental health epidemic that is all to prevalent in our Republic. So by helping anyone who needs our help will have a knock on effect in helping everyone who is on our-land looking for help. Together we can all help each other. Keep an eye on www.ballykeeffeamphitheatre.com and Facebook for updates. Next Monday 11th September is the 30th anniversary of the murder of Peter Tosh. Please take time to remember this amazing artist and activist who was taken from the world at the young age of 42. His legacy lives on.